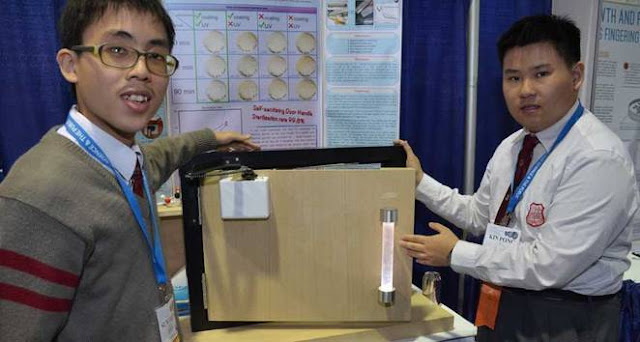 Two students from Hong Kong recently took second place at the Intel International Science and Engineering Fair in the materials science category for an invention that's pretty remarkable. The teenagers developed a door handle that is self-sanitizing, killing germs that are spread by hand contact. Sum Ming (“Simon”) Wong, 17 (left), and Kin Pong (“Michael”) Li, 18, of Hong Kong show off the self-sanitizing door handle they developed. It’s powered by opening and closing the door. This concept is simple. Every time the door is opened, the movement creates power that triggers a germ-killing reaction on the handle. In lab tests, their system killed about 99.8 percent of the germs that they spread onto lab dishes coated with their material. Research by others has shown that door handles in public areas often host lots of bacteria and viruses, notes 17-year-old Sum Ming (“Simon”) Wong. The tenth grader attends Church of Christ in China Tam Lee Lai Fun Memorial Secondary School in Tuen Mun, China. He and schoolmate Kin Pong ("Michael") Li, 18, wanted to design a coating for door handles that would be hostile to germs. After doing some research, they learned that a mineral called titanium dioxide is known to kill bacteria. It’s already used for other purposes in many products, from paints to sunscreens to edible puddings. To make their coating, the teens ground the mineral into a very fine powder. Titanium dioxide kills bacteria best when lit by ultraviolet (UV) light, says Simon. UV wavelengths are among those in sunlight. But indoor handles and any used at night would have little natural exposure to UV light. So the teens are lighting their door handle from within. Now, every part of the coated handle will see UV light.